It immediately struck me. 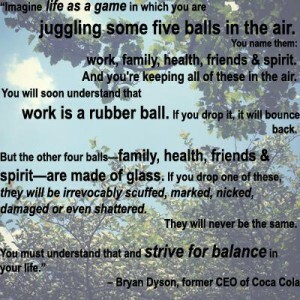 I had never thought about work-life balance in this way, but it resonated with me. I could picture myself attempting to juggle, and occasionally dropping, all of these balls. And, like the quote suggests, my priorities were on the wrong ball. Work stayed in the air, while my family, friends and health fell to the ground. Luckily, I never shattered any of those glass balls. They’ve all been repaired and polished to a shiny, sparkling silver glass. And work? Its bounced many times, and always ended up back in the air. Early in your career, it’s tempting to spend all the time you can working, and it usually takes something breaking for you to realize you need to take a step back. I learned to set a time to leave at the end of the day and stick to it, limit the days I bring my work home with me, and take time off when I need it. What balls are you juggling? How do you manage to keep them all in the air?